Superintendent James Collis from Sussex Police explained, “as part of our ongoing investigations into the criminal use of drones which has severely disrupted flights in and out of Gatwick Airport, Sussex Police made two arrests just after 10pm on Friday December 21. 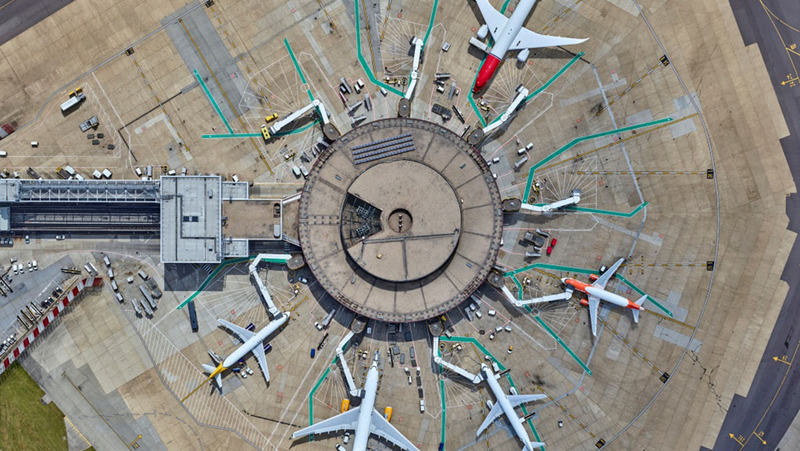 No further details are available, although Gatwick has a long history of antagonism from residents opposed to expansion of the airport, usage of the airfield’s secondary relief runway as a second runway, additional flights, and other local concerns. Further, UK airports have frequently been targeted by protestors seeking to highlight the role of aviation in contributing climate change. There would be little surprise either at Gatwick Airport or in the UK aviation industry if indeed it turned out that the disruption had been down to one or a combination of these factors. Impressively, very few flights were showing cancelled through the day of December 22, the Saturday before Christmas. Delays of one to two hours were, however, fairly commonplace, but a surprising number of flights were also on time. Gatwick expected to operate the vast majority of the 757 flights scheduled Saturday, carrying some 124,500 passengers. As of Saturday evening, cancellations on the airport’s flight information display system showed cancellations from Air Arabia, Kabo Air and WOW Air, each with one single cancellation. Sunday’s schedule was showing as largely expected to run to time. “Our runway is open and we aim to run a full schedule on Saturday 22 December,” said Gatwick Airport in a statement. The fallout, however, will be substantial. Airports, passengers and authorities around the world have been watching the empty skies south of London this week — as will nefarious actors interested in disrupting airport operations, whether owing to local airport expansion reasons, aviation’s impact on the environment and contributions to climate change, or simply those using this sort of activity to make a point about their cause or politics. British pilot union BALPA reissued its advice to aviators in the event of drone sightings, which is made up of five parts: Speed, Inform, Delay, Avoidance and Report. On speed, says BALPA to pilots, “if a drone has been reported, consider requesting a speed reduction: initially to minimum clean, including during departure; on STAR, initial or intermediate approach, request a further reduction to 180kt; on final approach observe ATC speed constraints to maintain separation.” At the same time, air traffic controllers should expect pilots to request speed reductions. Once notified, air traffic controllers should inform their supervisors, neighbouring ATC sectors, pilots on the frequency and those joining the frequency. Both pilots and ATC should plan for delays, diversions and closure of the airspace or aerodrome, BALPA says. Pilots should “request alternative routings or radar vectors if deemed necessary,” while air traffic controllers should “consider the safety of the operation and avoid the area if deemed necessary”. Both pilots and air traffic controllers should file appropriate safety reports as established by their airline and air navigation service provider, respectively. Authorities from the airport to local police to the UK armed forces to the UK government have been sharply criticised over the length of time that a very limited number of people were able to take out critical national infrastructure. Reports in UK media suggested that a shortage of civil servants to manage and direct legislation concerning drone safety, driven by a lack of staff owing to preparations for the UK to leave the European Union, had delayed governmental action on the topic. “We are working with industry on the development of counter-drone technology to protect against the malicious use of drones and we offer advice to businesses on specific protective security measures,” a government spokesperson said. Important to note that the couple initially arrested have been released without charge and are now NOT regarded as suspects. Their lives have been severely impacted by being “outed” in at least three major UK newspapers – Surrey Constabulary deny being source of the leak. Source of all this: BBC. My suspicion is that they were dobbed in to the police by some neighbour who also phoned the papers. That is, the culprits have not been apprehended and the motive is therefore unconfirmed, though as the article states, environmental activism is suspected.